Dacetacular Gaming For a Cause: LIVE FEED! Hey, Hey, Hey Dacetacular Nation!! The time has come!! 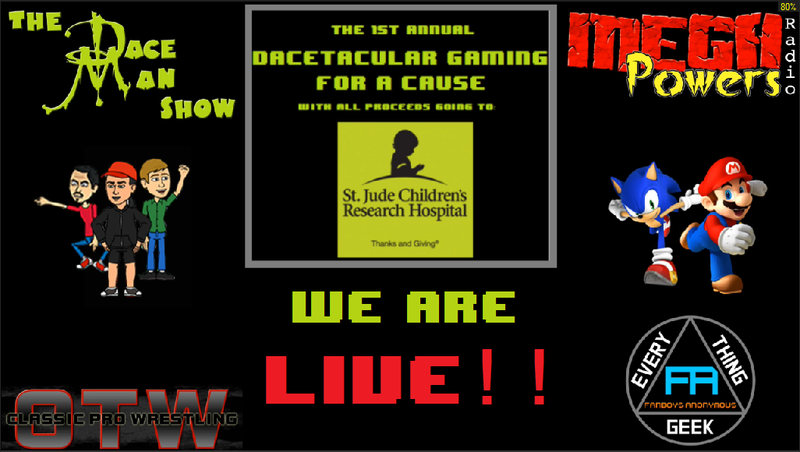 The Dace Man Show is partnering up with Fanboys Anonymous, Mega Powers Radio, Nerdgenius, and Old Time Wrestling to kick off this 24-hour video game marathon with all proceeds going directly to St. Jude Children's Research Hospital! Kicking things off. Join the crew as they take on the world of 8-bit and their childhood! Watch as they battle through The X-Men Arcade Game, Punch Out, the original Donkey Kong, and more. The block will culminate with a Street Fighter 2 tournament to find out who is the best SEGA Genesis fighter. They may not be the most athletic bunch, but they will take on sports games from franchises such as the WWE, MLB, NBA, and NFL. Capping the four-hour block will be a Wii Sports Tourney, most likely tennis. These are peak gaming hours for the crew, and it will literally be a free for all, playing anything we want, doing whatever we want, and saying whatever we want. This block will be rounded out with a SUPER SMASH BROS. TOURNAMENT!!! All things shooting, ranging from the Call of Duty franchise to GoldenEye. From 3 AM to 4 AM, when all the remaining people are delirious from lack of sleep, we'll run around in Time Splitters with a VIRUS Tournament!! Like the dirty old men/women we are, we will be playing all things adult humor/situations during the four hours of naughtiness. No tournament this block, just mass perversion and confusion. Like all infamous heroes we need a time of redemption. Join the crew as they wrap up the event and finish fighting the good fight. They'll play games such as InJustice, Marvel Ultimate Alliance, and anything superhero related! For every $5 donated to the cause, your name will be entered into a random drawing for awesome prizes brought to you by our sponsors! Limited Edition I Got Game Play T-Shirt! !